Creative sushi rolls. Impressively fresh ingredients. 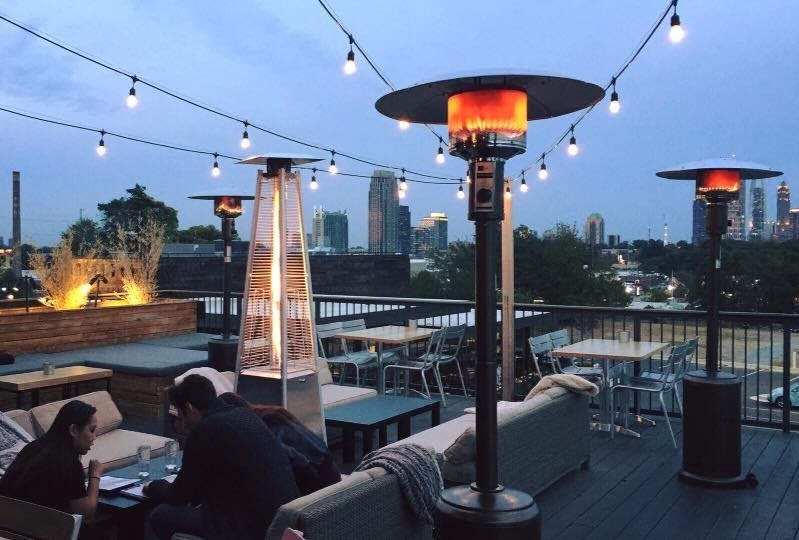 Fantastic views of Atlanta from the rooftop bar. Need more reasons to visit O-Ku Sushi? Keep reading about the new Japanese restaurant on Atlanta’s west side. WHY GO: Because you’re craving better-than-average sushi, on a rooftop, with a kickass view. THE VIBE: Cool and dimly lit, O-Ku is the place to see and be seen on a Friday or Saturday night. DRINK THIS: Try a new bottle of sake. Ask your server for a recommendation: The staff is very knowledgeable and knows how to match your taste buds to the flavors of your upcoming meal. EAT THIS: Start with the scallop tiradito as your appetizer. This is potentially the best starter I’ve ever had at a sushi restaurant: Raw scallop that’s perfectly torched and served with truffle shavings, caviar and truffle soy. This dish is a must, I tell you! I also had the hamachi carpaccio, twist pepper roll, barracuda nigiri, and a chef’s tasting of moriawase (mixed sashimi or nigiri platter). O-Ku is the only sushi restaurant in Atlanta (that I’ve been to) that does nigiri properly: A generous portion of raw fish over a small ball of rice, instead of the other way around. The selection of seafood is also better than at most restaurants: Where else can you find barracuda and jelly fish and bonito all in one night? As you may have figured out by now, I’m a big fan of raw seafood, so all of my recommendations above include raw ingredients. If you’re not a fan, O-Ku does have cooked options you can choose from, like shrimp and crab nigiri/sashimi, as well as hot entrees, some of which aren’t seafood based. After dinner, be sure to grab dessert or a drink at the rooftop bar. LOGISTICS: Located inside Westside Ironworks (next to Barcelona and Tom + Chee, and across from West Egg Cafe), O-Ku Sushi offers complimentary valet parking. It's also within walking distance to great after-dinner places, like Little Trouble and Ormsby's. Oh, and every Monday and Wednesday, all sushi rolls are half price 5-7 p.m.! This looks so delicious that I think I may need to travel just to enjoy it!